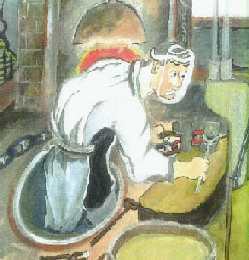 On most days, on my way back from primary school, I had taken a view of a workshop of my father. The sharp metallic sound caused by forging was heared as "Ton-ten-kan,Ton-ten-kan". Metal rod at white heat is forged its both edges into flat shape. At next action, metal rod is bent into circle shape, and edges which are flat-shaped are lied one upon another and connected into one rod circle. Next one rod circle is connected both edges into circle in shape of chain cross, and so on. I feel it was a kind of magic. I thought why metal rod are able to bend and why both edges are able to connect one rod ? I who was a child had gazed earnestly at emited sparks until the evening closed in.